Free video explanations for every practice problem in the Official Guide here. There is no prep like the ETS guide. Simply put, these questions are written by the very company that will write the questions you’ll see on test day. And those questions, as well as the ones in this book, are written according to exacting standards. There is a sophistication, complexity and “trickiness” to the questions that is saliently absent from the content of the books I reviewed last week. However, ETS is not the first place you would necessarily want to start prepping. The main reason is, ETS does not provide the best strategies for approaching the questions on the Revised GRE. Nor does ETS really intend to help students, especially those who are scoring at the lower levels. Really, they have no motivation to – they are simply providing practice problems. Also, ETS does not provide the best explanations, a fact that may be surprising, given the high quality of their content. But remember, they do not really have incentive to provide you with the most lucid explanations, so that you will do better on test day. ETS has already written the questions, and they know people will pay for them. So, the explanations are average (in this regard, Kaplan does a far better job. However, Kaplan’s questions are iffy and suspect, so this point is basically moot). So, if you have picked up your strategies from The Princeton Review book (a good book for strategies) and/or Magoosh (a great place for in-depth strategies…with plenty of practice problems), and have done some practice problems, then you can start with the ETS materials. The Official Guide to the Revised GRE also offers the PowerPrep software, which provides you with an actual GRE test, along with a score range after you’ve finished. This is the single best prep for the exam. Why? Because the computer interface—down to the very last pixel—is exactly what you’ll encounter on test day (unless you are taking the paper-based version). And, if you haven’t taken a test on a computer, the experience can be very different from those found in books. The bottom-line: if you are serious about scoring in a competitive range on the Revised GRE, then picking up a copy of the Official Guide, along with CD, is critical. Update: to address our dissatisfaction with the explanations given in this book, we’ve recorded our own set of video explanations for every question. Enjoy! This is the sixth in a series of new GRE book reviews. Hello, is it really necessary to read every single page in the ETS official guide after taking 200+ practice questions on Magoosh AND taken the Powerprep Test 1? Or do you recommend specific chapters that I should focus on more? The most essential material in the ETS Official Guide to the GRE is the practice tests and practice questions. You definitely want to go through as many real practice GRE questions as you can. The quesitons made by ETS itself are the best prep materials for the test. As for the other parts of the OG, I recommend skimming through them for helpful advice and information. You may or may not need to read every part of the OG, but it’s a good idea to glance at all that this official resources has to offer. I am working and I didn’t get time to preparation for GRE and I am doing planning for GRE exam in octomber to November but I have no any idea how to started best plan for study which helps to getting more score. what’s study plan should I do? 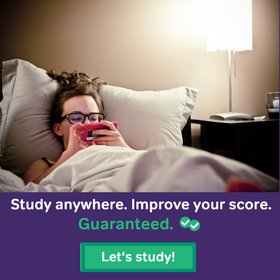 Thanks for writing 🙂 I recommend checking out our 3-month study schedules to help you plan your GRE prep. These schedules fit well with your timeline, given that you plan on taking the exam in about 3-4 months. We have a weekly schedule, as well as 3 different daily schedules, which are based off of different starting points and goals 🙂 I’d suggest reading through the different plans to determine which one will suit you best! Hope this helps 🙂 And good luck with your studies! If I am doing the 2-3 month weekly GRE schedule. I am low on funds and want to see if this can work as well since I bought this book about a year ago. Hi! I will be taking my GRE a month from today- and I haven’t really prepared much yet. I’ve only done 80% of the verbal questions from 5lb Manhattan prep and the ones in the official guide. This was in a study streak of 7hrs a day for 4 days last week. I gave a diagnostic test of the quant and didn’t think necessary to study much- just doing 10-problems of each chapter from the 5lb book. I did a quick review of it all yesterday and gave the first paper based test today from the official guide. And I got 48 questions correct on quant and 40 on verbal and that suggests a score of 333. Although I’ve been a regular user of vocabulary.com for a year so I’ve got a good vocabulary and I like to read, but was surprised to get this good a score. Am I doing something right or am just very lucky? I just took the paper based practice test (version 1) and I did horribly compared to my scores on the Magoosh practice tests. But in reading your comments it seems it should be the opposite, ETS easier than Magoosh. I am worried that if I find the ETS test harder than the hours per day I have been spending on Magoosh that I will find the actual test questions much harder than those I have been practicing. Any ideas on what I can do? Hmm…I’m not sure if ETS is necessarily easier than Magoosh–it depends. Sure, the math questions don’t require as much time or as many steps. Yet, the ETS questions tend to be more of the type that you were confident you got the right answer, but you actually didn’t. What I would recommend is reviewing the questions you missed to get a better sense of what’s going on. Is there any general pattern you can pick up on? Do the wording of the questions feel different from Magoosh or other practice materials? My guess is that once you practice a little more with ETS content–and they are about to release the new Verbal and Math guides this week–you will start missing fewer questions. By the time tests rolls around, there should hopefully not be too big a difference in your performance on ETS questions. The explanations that you provide are for the 1st edition for the ETS – correct? Would it be more beneficial if I bought the 1st edition instead of the 2nd? Thanks! Actually, the 2nd edition is exactly the same as the first (the only difference is there is an entirely new test at the end). So hopefully, that shouldn’t make a difference. As for the help tab it’s on the very far left, at the margin of the window, and is positioned vertically (it’s black). ETS does not release any vocabulary-related study resources. The only thing we get in the way of GRE vocabulary is the ones that show up in the questions that are in the Official Guide. Looking at the ETS GRE book (2nd edition) and the 90 day daily sch. Does the pages/chapter that are suggested coincide with the 2nd edition? Or only the 1st printing? Also I am considering the kindle version, CD doesn’t matter for that as long as I get the book practice questions correct? Yes, the 1st and 2nd edition have the exact page numbers, at least up to page 373. At that point the 1st edition is basically over, and the 2nd edition (which at this point throws in an extra scoring chart) has a second practice test in the back. As for the CD-related question, you’re asking if the Kindle edition is the exact same except for the CD. I believe so — though I actually haven’t downloaded the Kindle version yet. Sorry I couldn’t be more helpful :(. In these past few years, was anyone able to figure out if the kindle version is just as good as the book version? What about the CD for the kindle version? I’m trying to buy the book online but it’s hard to with international shipping so the kindle version is much easier but I want to make sure I’m not missing out on the CD! Lisa, I think this blog post might help you! : https://magoosh.com/gre/2012/ets-practice-tests-powerprep-ii-and-the-official-guide-book-and-cd/. Basically, you can get everything from the CDs by just downloading Poweprep online for free, so don’t worry :). What about practicing from 1014 practice questions of new gre from Princeton Review ? Is it good for preparation . I have already done my quantitative from barron . Looking forward for a quick reply I have only one month. I do not recommend the 1,014 practice question book. It is so riddled with errors, both in terms of questions and in terms of answers/explanations to those questions, that students usually end up throwing the book against the wall in disgust. Btw, Have you checked out our one-month study schedule? The link seems like it’s incorrect on our page, we’ll be fixing that shortly. Thanks for letting us know about this, and sorry for the confusion! 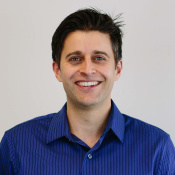 Magoosh has video explanations for the paper based practice GRE from ETS but these answers do not match up with the questions that are found after following the link. Is there any way to fix this? Your reviews have been very helpful in my GRE prep, i echo your view that the official guide is the most authentic material out there. However, the number of “hard” questions in both quant and verbal are very limited, such problems are found in none of the other books. Can you suggest a website/book which has problems very similar to the official gre guide? My GRE is a week away. Not to toot the Magoosh trumpet, but I believe for both Verbal and Quant we have the toughest, most GRE-like questions out there. 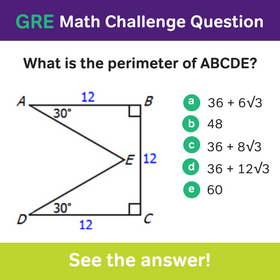 Manhattan GRE also does a good job with harder questions, specifically in their on-line tests. Let me know if I can answer any other questions :). Here’s a question. Why in the hell is ETS coming out with an updated guide to revised GRE one year after introducing the test? Has anything changed? I scored a 1200+ (580 and 720) when taking the powerprep 2 practice test; however, i signed up for the free trial and tried the practice tests on magoosh and got demolished. the questions were much harder on magoosh. does this mean magoosh is harder than the GRE or is powerprep questions easier than actual GRE problems? i was fairly confident and figured i only needed to improve on vocab but magoosh destroyed that confidence. Indeed the Magoosh questions are more difficult than those found on the actual test. But don’t lose heart – if you can get these right, the questions test day should be nowhere nearly as difficult (quite a few Magoosh users have said this). We also have a great score predictor feature that tabulates your projected score on the actual GRE based on your performance. Let me know if you have any other questions :). Does the PowerPrep CD that comes with the ETS book run on a Mac, or only on a PC? (I know the downloadable version only runs on PCs; I couldn’t find info about the CD version.) Thanks. Unfortunately, the practice material on the CD doesn’t work on Macs! 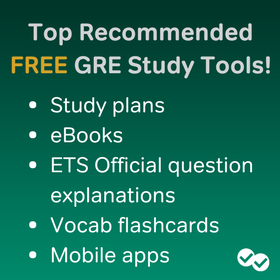 As an alternative, I’d recommend using the free PDF of the paper-based test from ETS, we have video explanations for all of the questions as well as the link to the PDF here: http://gre.magoosh.com/videos-for-revised-gre-paper-test. I hope that helps! Is it neccessary to purchase the ETS book WITH cd? Isn’t the powerprep software offerred online for free? Or are there different exams on the cd and the website? practice questions in the book. Has the ETS released more than 2 full sets of new GRE questions? I know that PowerPrep II has one set, and the book has another full test. Are there any more than that? For now, that’s all that ETS is offering us. I do hope it decides to release more practice material soon. I have a feeling – once all this equating is done in Nov. – that they will offer more content/tests that will give scores based on the new range. Just as I thought, the ETS material is indeed the most accurate in that it mirrors the difficulty of questiosn on test day. The math was more difficult and tricky than other prep material I’ve encountered, and the verbal was definitely more well written. However, in the ETS booklet, their math sections consisted of 25 questions for 40 minutes. Does that reflect the length and time of math sections on test day? On the ETS website they seem to say it’s 20 questions for 35 minutes. The practice test included in OG is for paper-based GRE, so it contains 25 questions in 40 minutes. The PowerPrep II software is very close to the test day experience: 20 questions in 35 min. for math, 20 questions in 30 min. for verbal. Thanks for that! I didn’t realize the length/pacing for the paper & computer based tests would be different! Yes, Huan-Ling is right on every point! The good news – if you are taking the computer-based exam – is it will be shorter. And as you’ve corroborated, the material on the real test is much more difficult than any encountered in the major publishers. As a tutor, I always want to make sure students are prepared as possible – that’s why I usually avoid material from PR and Kaplan (esp. for quant) and use Barron’s (only up until a point). In the past, for quant, I’ve written my own questions, coupled those with ETS material, and even some GMAT and SAT, for the best results.